Tibetan filmmaker Dhondup Wangchen receives the prestigious Courage Award. 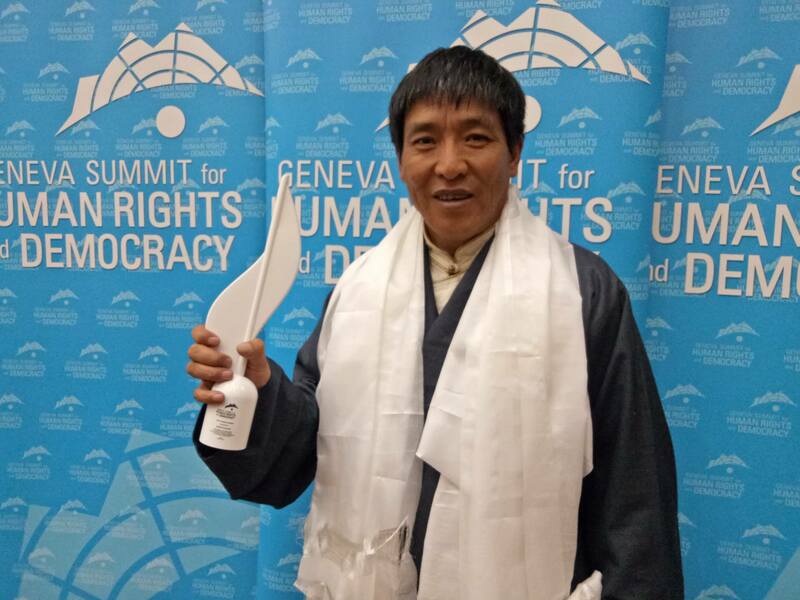 Geneva : Tibetan filmmaker Dhondup Wangchen has been awarded the 2019 Courage Award by Geneva Summit. Shot just before the 2008 Beijing Olympics, Wangchen’s documentary “Leaving Fear Behind” gave the world a rare glimpse of Tibetans living under the brutal repression of the Chinese Communist Party. He served a 6-year arbitrary sentence in a Chinese prison where he was subjected to torture, intensive forced labour, systemic discrimination and denied any health services or family visits. 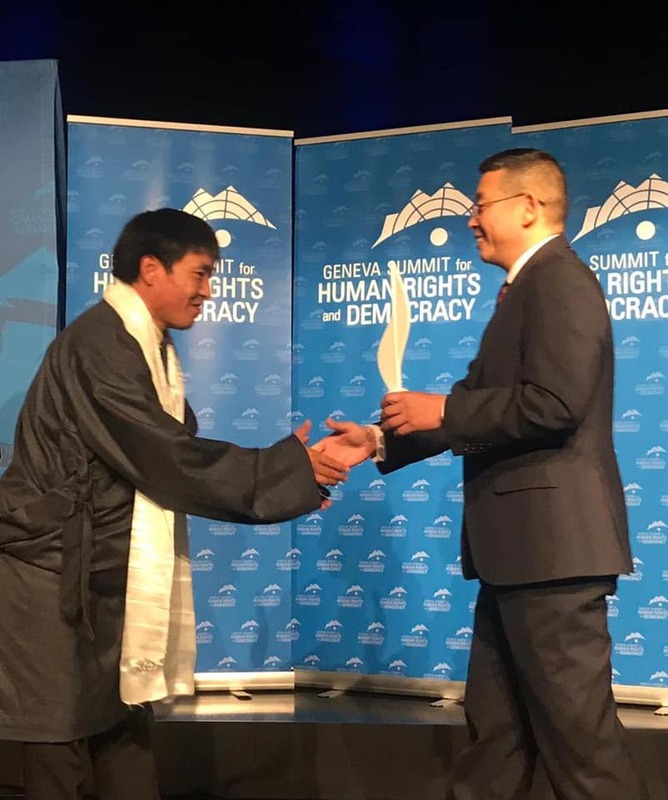 Yang Jianli, Chinese dissident and President of Initiative for China, presented the award to Wangchen at the 11th annual Geneva Summit for Human Rights and Democracy. Previous laureates of the Courage Award include Chinese dissident Chen Guangchen, jailed Saudi blogger Raif Badawi, leading Russian dissident Vladimir Kara-Murza, and Venezuelan opposition leader Antonio Ledezma. “It is because of your support that I am here today. I never imagined that a day like this will come when I’m finally able to speak freely, breathe the air of freedom in this free world. It feels surreal that I’m standing in front of you here, accepting this honor and sharing my experiences with you all,” said Wangchen in his acceptance speech. He also expressed deep gratitude to the many NGOs, Tibet Support Groups, various international governments and individuals who relentlessly advocated for his release. Wangchen appealed for the international community’s support for the Tibetan struggle. “The courage you had shown yesterday changed my today and the courage we show today will change the future of Tibetans,” he added. Before the ceremony, Wangchen and other speakers met with various UN diplomats in a closed-door meeting. He briefed them about the disturbing situation of Tibetan political prisoners and urged the diplomats to raise specific Tibetan political prisoner cases in their meetings with Chinese representatives. 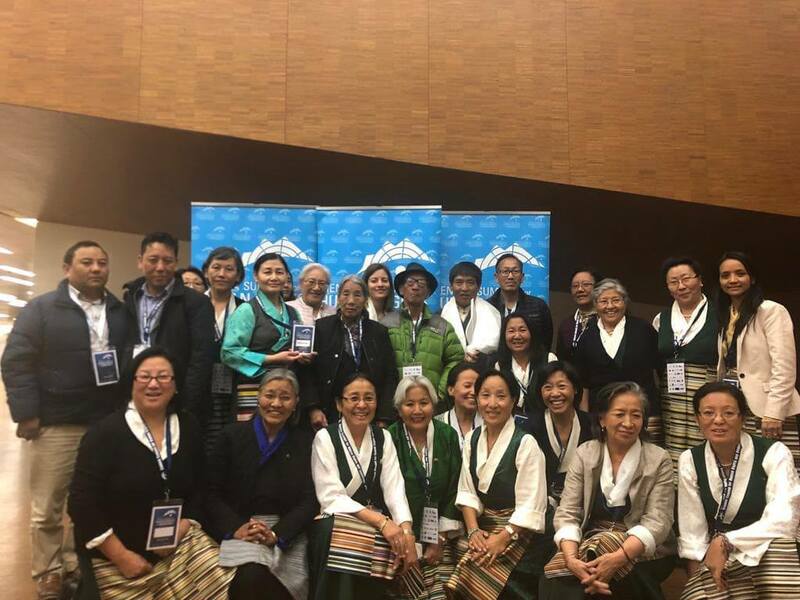 The Tibet Bureau Geneva would like to thank the Offices of Tibet in Washington, DC, and Australia for their assistance in facilitating Dhondup Wangchen’s successful visit to Geneva. Chinese dissident, the former political prisoner Yang Jianli presents the Courage Award to Dhondup Wangchen. Dhondup Wangchen along with his family, Representatives of Tibet Bureau and Swiss Tibetan Women Association.